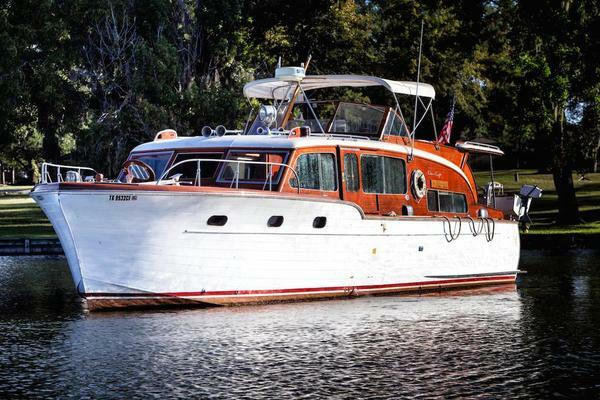 YOU WILL NOT BE DISAPPOINTED IN THE CONDITION OF THIS HIGH-QUALITY YACHT! Updated Electronics with RAYMARINE E125 & E127 with HD Radar, and new KVH M5 SAT TV. Meticulous owner continuously upgrades & maintains this vessel, needs nothing. Semi-circular settee with storage under and low table. Hi gloss cherry cabinetry incorporating: Ice maker, TV and Bose audio system, Cutlery set, Drinks unit with set of crystal glasses. Stainless steel framed, curved full width door to aft teak laid cockpit. Tinted glass to side windows (electrically operated), recessed overhead lighting, overhead grab rail, wooden blinds. Semi-circular dinette at raised bridge deck level facing the lower helm position, with an open view forward and access stairway to flybridge and AC/DC control panel. King sized 6'6" X 5'7" double bed with innerspring mattress and under storage, Designer soft goods, Twin wardrobes with interior lights, Mid-level storage compartments, Recessed lighting, Reading lights, TV with SAT receiver, A/C controls, AM/FM/CD, Twin opening port holes with wooden venetian blinds, Large hatch with fly screen and privacy screen to foredeck, Full length mirror, Access to spacious en-suite head with sink and separate shower stall. Double 6'6" innerspring bed with under storage, Designer soft goods, Desk/Vanity unit, Double wardrobe with interior light, Twin opening port holes with fly screens and wooden venetian blinds, A/C control, TV with SAT receiver, AM/FM Radio, Mid-level storage doors, Recessed lighting, Reading lights, Private access to spacious day head with separate shower stall. Twin 6'6" single beds with innerspring mattresses, designer soft goods, bedside table, Mid-level storage compartments, Wardrobe with interior light, A/C control, TV with SAT receiver, AM/FM Stereo, Twin opening port holes with fly screens and venetian blinds, Recessed lighting, reading lights. Stainless steel through hull anchor system, Delta Anchor, 25 fathoms calibrated chain, Electric anchor winch, Twin Stainless steel bow & stern cleats, two pairs of stainless steel spring cleats, Stainless steel cleat and grab rail on each aft wing, Stainless steel pulpit and side deck rails with solid second rail and fender baskets, Full set of IMCO navigation lights, Moulded slip resistant deck surface, Sunbathing area on foredeck with cushions. Teak stairway to flybridge, Teak laid cockpit floor, Bench seating with access to large aft storage area, Twin transom gates to extra-large teak laid bathing platform, Hot & cold transom shower, Twin storage lockers, Access hatch to stowage hold, Fender storage, Twin warping drums, White cockpit overhead lights. Twin Access via stairway from salon and by teak stairway with stainless handrail on aft deck. Blue Perspex hatch to internal stairway, large sunbathing area forward of helm position, seating to starboard of helm that converts to tilting sunbed, Flybridge bar complete with refrigerator, ice maker, sink, barbecue griddle and trash bin. Large C-shaped seating area with table that can be electrically lowered to convert area into sunbed. Stainless steel guard rails and grab rails and abundant storage. Stainless steel windscreen with electrically opening side window, Madrone wood finish instrument panel, electrically adjustable double helm seat, Electric single lever engine controls for engines and gearboxes, Full engine instrumentation, audible alarms, Remote anchor controls, Chart table and light, High speed compass, water level gauge, Bilge pump switches, Navigation & running light switches, 12V outlet, Door to side deck. Three Forward Facing Helm Seats and Most Items Repeated. Owners personal belongings, please inquire.